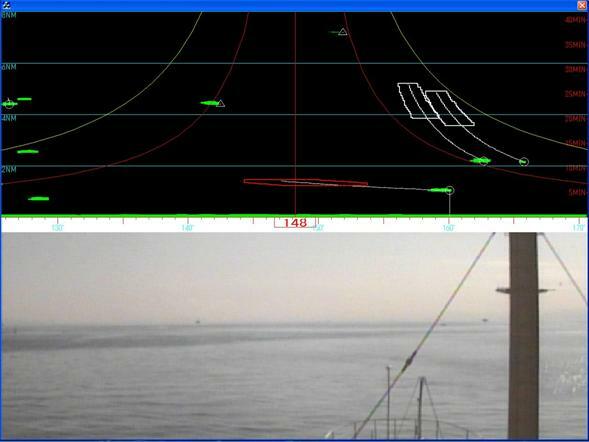 – INT-NAV shows video image of seascape on a lower part of display. – INT-NAV shows target information such as RADAR image, relative position, future track and collision danger zone on an upper part of display. – The target information is plotted the distance from own ship vs. the direction of own ship. – The silhouette of target ship and its information is directly linked vertically. – INT-NAV shows the future tracks and collision danger zone of each target ship. – The collision danger zone provides danger heading, which makes it easy to find safe heading to avoid all target ships. – image of INT-NAV with radar and ARPA information and collision danger zone. – Horizontal link between silhouette of target ship and its information is effective to fine collision danger ship from seascape.